This episode was somewhat interesting to me. There were a lot of story line teasers within it... Some I am excited about whereas others, not so much. There was once something, but now... Nothing. In continuation of last week's episode, Elena and Damon finally see each other. Damon stares at Elena with longing and deeply loving eyes. All he wants to do is kiss her and she simply stares at him blankly, but also in possible terror because of what was left of her memory. He gives this amazing, heartfelt speech that any woman would hope to hear from the love of their life. Unfortunately, she feels nothing because she remembers nothing and shuts the door in his face with an apology, leaving Damon sad. I'm human and even though I'm in pain, I like it. Last week, Alaric became human after crossing the Mystic Falls "No Magic Zone" and being saved by Jo when reliving the death that turned him into a vampire. In intensive pain, he thanks Jo deeply for returning him back to his old self. Jo asks him out on a date to a fundraising event and Alaric agrees. I believe that there is a promising future for these two. Of course, Damon isn't happy. So he goes to visit Alaric in the hospital. He begins fiddling with his IV machine because he's still upset about Alaric compelling Elena to forget him, being sarcastic in the process. Alaric still feels guilty about it because he didn't want to do it in the first place. That guy who kept burning people in his vampire mobile was caught by his once-prisoner Enzo with added help from Matt and Stefan. Enzo attempts to torture him to find out who the other people were that were apart of his vampire crusade. Unfortunately he doesn't speak. Tripp tries to convinces Matt that he's on the wrong side. We then find out that Caroline's mom, Sheriff Forbes, is held hostage by Tripp's army of vampire hunters because Tripp is missing. His clan knows that Caroline's a vampire which is why they came after her mom. She likes him, but what does that even mean? Stefan finds out from Enzo's announcement that Caroline likes him. Stefan is basically in shock and does not state whether he is into Caroline or not. Caroline says that she prefers to hate him, so that she won't like him. Please don't put those two together. They save the Sheriff, but Tripp falls down. Matt gets the vampire clan to exchange Sheriff Forbes for Tripp at the Mystic Falls border. Unfortunately once Tripp crosses the border we find out that his throat was slit. He was transitioning into a vampire. Enzo slit his throat and Matt seems to be pretty pissed about it. You're evil, so now we're stuck here for eternity. Kai stabs Bonnie with an arrow. She kills him (he lives obviously) and runs off with the pieces of the broken ascendant to the hospital. As she grabs pain killers and a bandage, she puts it together only to find out that a piece is missing. Kai has the other piece and shows up. Bonnie uses her magic to throw him into a corner and hops in a car. Kai shows up and demonstrates his magic stealing powers. They put the ascendant together for the eclipse to take them to the present time. Kai attempts to manipulate Bonnie and tell her that he wants to be better, "more liker her." Bonnie doesn't believe him and yet again sacrifices her chance to go home because of her fears of what Kai may do once he gets back to reality. 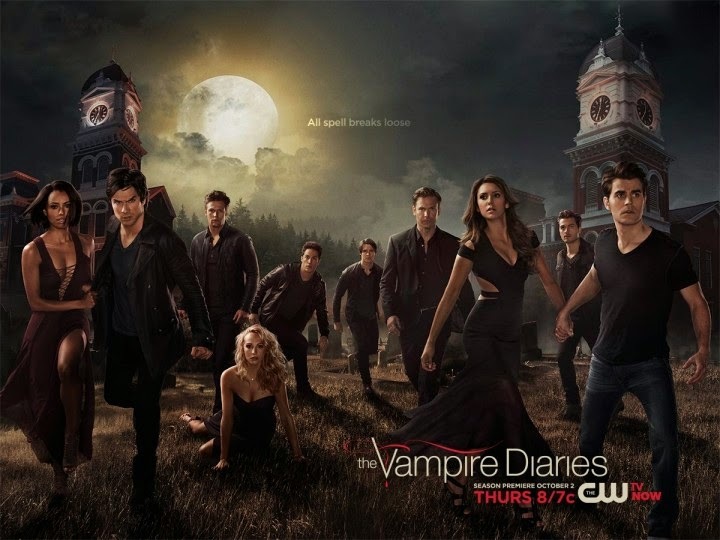 She places her magic powers in her stuffed bear and transports the bear to present day Mystic Falls, leaving no way possible for them to get back to the present. You see that girl with the scar? That's his sister. Jo invites Alaric to her place for pizza after spending time together at the fundraiser. We find out that she doesn't practice magic and she separates herself from her witch life. We also find out that Jo has a scar on her stomach that is similar to the one Kai said that he gave his sister. Let me make up your killing someone to save me by wearing a tie. Liv asks Tyler to help her out by being a server at the fundraiser. Tyler seems as though he acts like serving people and wearing a tie is some sort of repayment, but in a sort of adorable, cute, I like you kind of way. Liv explains to him that that's not how you repay someone, considering she killed a guy and she's never killed an innocent. Her brother shows up and tells her that there is no point in falling in love since their coven may call them home at anytime. "Let me compel your boyfriend, but let me also steal you away." "I'm going to almost kill myself, but you're going to let me go." "You're a liar and I'm going to find out the truth." At the party, Damon sees Elena with Liam, her doctor date. Damon compels him a few times and then steals Elena away in hopes that she'll remember as they talk. Elena wants to remember, but she can't. Damon takes her to the borderline of Mystic Falls and talks about their last moments together. Elena still remembers nothing and runs into Mystic Falls in hopes that the compulsion will wear off and she'll remember something. The viewers see glimpses of their relationship and how it came to be as she chokes on the water that killed her, turning her into a vampire. Unfortunately, Elena seems as though she barely remembers anything except the one memory Damon held onto of them standing in the rain. She asks what happened within that memory and we see them kissing each other as the shooting stars went across the sky, but Damon realizes that she has the life that she always wanted. She's finally happy and that's all he ever wanted for her to be. So he lies to her about what happened and leaves in sorrow. Later on, Liam shows up at Elena's dorm and goes off on her about lying about her "dead boyfriend" and the girl who had wounds in the hay field. He knows that something is up and basically removes his trust from her. He vows to find out how the girl went from almost dead to walking past him like she just ran a marathon. Damon in complete and utter sadness, grabs his other best friend, Liquor and drinks up as he visits Bonnie's grave. He finds her stuffed bear and realizes that she is alive. Side Note: The Honorable Mention Goes to Damon for not killing someone. Damon has came a long way and become a better person. He went from killing machine to responsible adult. He gets the award for the Person Who Has Had the Most Personal Growth on a Show. Because let's be honest, back in the day he would have snapped Alaric's neck and bit Liam's face off until it was just bones. Tripp didn't remember getting his throat slit? Why didn't he tell Matt? He knows about the no magic rule once he crosses into Mystic Falls. However, it does take a while for people who are transitioning to remember things, but still. How long was Alaric in the hospital for him to just be released to go to a shindig? He wasn't fed vampire blood. He should have been there for a good week and a half with all of the blood he was leaking out. DO THEY EVEN GO TO CLASS? Bonnie can hem you in a corner with magic, but she can't toss you across a room to get home. Okay, that part didn't even make sense. She could have easily went home if she killed him or tossed him to the side. She could have also chained him up and went home. THAT IS A MAJOR FLAW. Elena hasn't compelled Liam. She could easily wipe his memory of seeing that girl hurt since I don't recall him being on vervain. Maybe she doesn't want to use your vampire methods? And again...where are the diaries? Damon may focus on trying to bring Bonnie back since he has the bear (with her magic, unknowingly). Liv and her twin brother are from the Gemini Coven, which means they would be able to bring Bonnie back. Jo is Kai's sister, so she may either try to stop the twins from releasing Bonnie and Kai or she may try to seek revenge on Kai. She could also probably help break the spell and release Bonnie from that eternity. Unfortunately, Stefan may have feelings for Caroline. Let's not make that happen, okay? Can Enzo and Caroline happen if we can't have Klairoline though? It could be Earoline...Eroline.. Cenzo... It all sounds awful, but they would be great together. Sheriff Forbes will get a job outside of Mystic Falls with no references, since everyone is practically dead. Tyler and Liv will fall in love. I actually ship Tiv or Lyler. I don't know what to call them. Alaric and Jo will live happily ever after. Based on the preview for episode 8, Liam is going to find out Elena is a vampire... Maybe he'll become a vampire at some point of time throughout the series. Of course, I don't ship them at all. Matt may seek revenge after Enzo and also take Tripp's place as the head police guy. Jeremy will help bring Bonnie back. Salvatore girl's purpose for coming back issss what? And our current villains are who? Kai annnnd I guess the fresh out of high school vampire hunters? Possibly the Gemini Coven? Oh and random thought, if Elena became human wouldn't she be able to do Traveler spells and whatnot? I mean, are we just going to forget everything that happened with the travelers last season orrrr what? Also what is Elena's purpose now? And what happens to supernatural beings when they die now? Don't forget to follow or tweet along with me at 8pm on Thursday's (Eastern Time) when Vampire Diaries airs.